Do not think the fact you can do a triple lutz or a double toe loop will be appreciated. The Dutch have been forced onto skates almost as soon as they can walk and they are into distance and speed, not kunstschaatsen. Without natural ice, skaters have to make do with artificial outdoor tracks which are usually open from October to mid-March and get very busy on sunny days. Rent skates and take lessons if you want to show off a perfect pootje over – the long low cross-over glide which distance skaters use to effortlessly take corners. Staggering around the ice clutching your mates or, even worse, a chair is strictly for the under fives. If you are in the Netherlands during a cold snap and the canals and lakes outside the city are frozen over, you are a lucky person indeed. There is nothing like gliding over smooth natural ice – skating over frozen canals and rivers, passing islands and through reed beds. The Dutch skating union keeps a careful watch on when and where it is safe to skate outdoors. You will need to bring your own skates – and make sure they have been sharpened to cope with all the hobbles and bobbles in the ice. You will, of course, blunt them when you scramble over bits where the ice is too awful or a bridge. Popular skating centres will have formal routes ranging usually from 10 km to 40 km which you can follow. 40km is a long way when a bone-chilling northeasterly wind is blowing. Koek (biscuits) and zopie (something to drink) are an essential part of outside skating. Today zopie is usually hot chocolate or pea soup but the word is thought to come from zuipie, or tipple, and used to refer to a generous slug of jenever, or Dutch gin. Necessary after spending a few hours in that northeasterly wind. 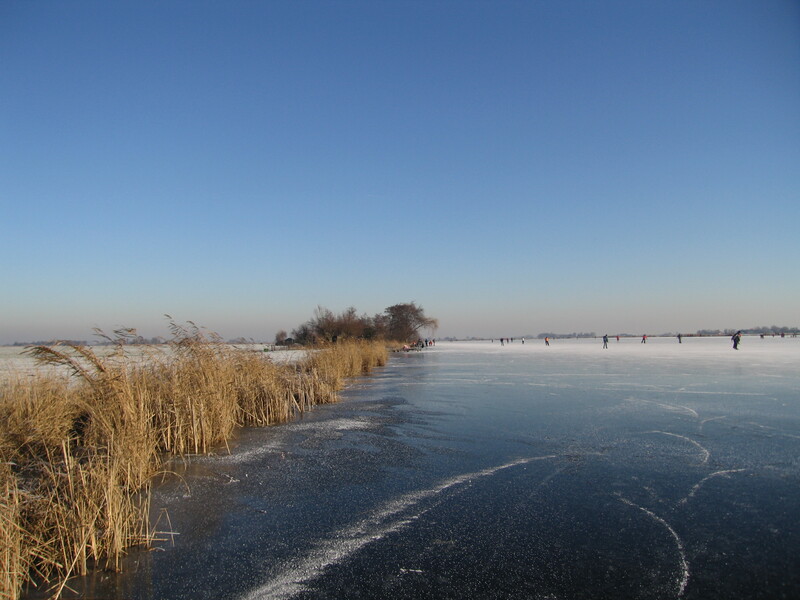 If someone is ijsvrij – literally ice free – it does not mean they have been defrosted, but that they have been given an extra day’s holiday to enjoy some skating. Traditionally school children and workers would be given a day off if the roads were too dangerous because of snow and ice or it was too cold to work. But since the end of the last century, some companies have been giving staff time off for skating as a gesture of generosity. Well, it is either that or have nobody turn up anyway. Yes, they exist. They hate the whole thing and wish with alll their hearts the ice will open up beneath the cheering Unox bobble hat-wearing crowd. Friesian non-skaters can’t wait for summer to arrive when they can indulge in their favourite pastime: pole vaulting over ditches, or fierljeppen. In Groningen it’s called bongelwuppen. The Groninger language is my first language and you taught me a new word: bongelwupppen. Enjoyed it. thanks. Groningers use words sparingly. Bring the beer to a boil along with the cinnamon stick , cloves and lemon. Let it all simmer gently for about 20 minutes. Stir the sugar with the eggs and use this to thicken thebeer . Finally add the rum. drink hot! 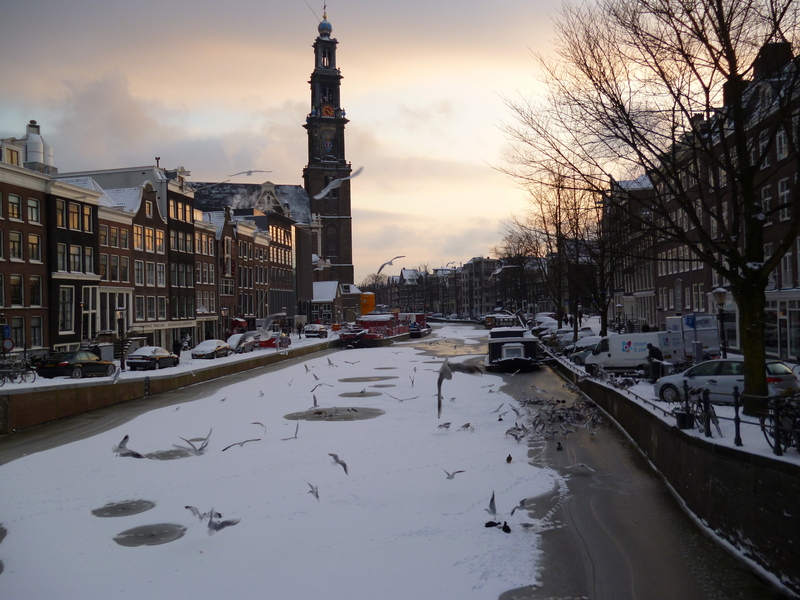 To the above: if there is ‘natural ice’ in the Netherlands, you’re likely to see some impromptu ‘koek en zopie’-stalls on the ice. A permit is usually not needed. However they can not sell alcoholic drinks, so the zopie on offer is peasoup and hot chocolate.